Oregon bottle collector Dale Mlasko has started a new antique bottle site. 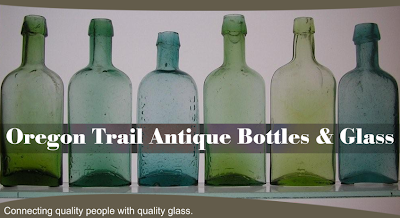 On the Oregon Trail Antique Bottles & Glass site you can purchase consigned bottles at a listed price or make an offer on the bottle. When I looked at the site this morning there were 3 western flasks and 1 western fifth listed for sale. One of the flasks, a Hotaling Portland example, was already sold. Other catagories listed on the site include: Who we are, How it works, Other glass for sale, Digging tools and News. Good luck Dale on your new site! Just wanted to tell I've enjoyed looking at your site. The history behind the Chalmer's Catawba Wine Bitters product is really interesting, I can see why you were actively seeking that bottle, the story sure makes the bottle and the product much more interesting! My commitment is to provide a fresh approach to collectors with research, digging news, and merchandise related to digging, and displaying bottles. I will strive to add new and interesting stuff weekly, and they will hit the site each Monday. I would like to focus on any high quality glass in the for sale / offer section, and welcome requests as to what you all would like to see. I want it to be a site that everyone wants to check every day, like this blog, and the whiskey blog. Thanks to the encouragement from everyone!